Have you ever felt anxious? Worried, concerned, or worse yet, completely stressed out? I know I have, and there was a time when I did everything I could—run, eat, hyper-prepare, shop, clean, organize—in order to whisk away the uncomfortable, sometimes incapacitating feelings of angst. But not so long ago, I had a shift in perspective and realized that being anxious is a gift. Before you’re tempted to speed dial the retreat for people who are in need of a long mental rest, (I understand looney bin is no longer PC) take a few minutes to see things from my new vantage point. Not so long ago, I was having one of those nights where I woke from a very peaceful sleep only to find my mind racing like a thoroughbred, attempting to find solutions to problems such as world peace, lackluster progress on the commencement speech I’d been working on, how many years I might live, and how much money I’d have to save to have enough for my earth minutes. Pressing stuff that needed to be resolved at three o’clock in the morning, right? It’s normal, it’s good to plan; At least that’s what I used to tell myself, since back in my professional pilot days, worry was pretty much a lifestyle in a job that there was no room to ever mess up. I focused on things like did I leave the battery switch on in the plane? (It’s not nearly as easy to jumpstart a jet as a car.) Was the pending weather going to clear, or was I going to have to find a route around the line of thunderstorms that were building when I went to bed? These kinds of scenarios pretty much monopolized my thoughts and at some point this elevated sense of nervousness became the norm. But what I didn’t realize at the time and have since learned, is that all this “planning” was stealing my peace and sense of joy, not to mention, wearing me out. Aware that a life filled with peace is my ultimate goal, I decided to get to the crux of my anxiety. When I started to examine what was at the root of my uneasiness, I discovered something unexpected. 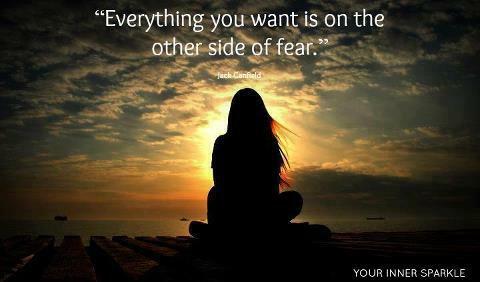 I learned that all of my anxiety stemmed from fear. That’s right, FEAR. The irony is that before this revelation, I would have described myself as relatively fearless. So to my otherwise analytical brain, this was a great gift because I already knew what to do when I was afraid of something; Enlist the time-tested action of facing trepidation and walking through it. Now I’ll admit facing fears can be quite daunting, but if I’m completely honest, I’ve never encountered a challenge, no matter how terrifying, embarrassing, or physically and emotionally difficult, that once worked through, didn’t turn out for the best. Even difficulties like dealing with an engine failure, writing a book with very little literary background, confronting volatile personalities, letting go of people and situations—including friends, family, and loved ones— admitting big mistakes, walking away, and jumping in and allowing someone to see the essence of who I really am, wasn’t as hard as I had imagined. Going forward, every time I start to feel a little edgy, instead of doing something to avoid the discomfort, I pause, thank the Universe, embrace the angst, and then get busy figuring out exactly what I’m scared of at that moment. Then, using the energy I used to burn worrying, I make a game plan to confront what’s frightening me. No, the anxiety doesn’t go away immediately, and yes, there are times that I still have my doubts. But overtime most of my worries have shifted into opportunities, chances to get to know myself better and grow. Understanding what’s behind my uneasiness has given me the chance to take action and work through whatever is holding me back. Anxiety is my heart’s way of signaling that I need to stop, dig deep, step-up and overcome. Moving worries out creates room for peace to come in; Clutter be gone!